What is Baptism? Baptism marks the start of a journey of faith, which involves turning towards Christ and becoming a member of the local and worldwide Christian family. It is a Sacrament: a visible sign of God’s love. In Baptism, we are thanking God for his gift of life and publicly acknowledging his love. We are acknowledging that we all need to turn away from the darkness of evil and to make a new start with God. When did baptism start? Jesus was baptised in the river Jordan. This was a turning point in his life (you can read the story in the Bible: at the beginning of Mark’s Gospel in the New Testament). Jesus told his followers to Baptize others as a sign that they had turned away from their old life, and begun a new life as Christ’s disciples, members of his Body, having been assured of God’s forgiveness. Making decisions and promises To make the decision to be Baptised is an adult response to life and many people, who have not been Baptised (Christened) as children, come to this point in their later lives. However, many parents want to have their children Baptised when they will be asked to declare publicly on behalf of their child that they believe in God and that you will bring their child up to follow Jesus. The declarations made by you and the child’s godparents will be made front of the church congregation. The Christian community will promise to support you and to pray for you and your child. In preparation for the event, we would ask families who are not members of our congregations to attend Mass on a regular basis. You will also have a number of Preparation Sessions and a rehearsal. Shouldn’t children make their own decisions? People worry that they are imposing views on their children; but from the moment they are born, you make choices on their behalf. You don’t wait until they are old enough to ask for milk before you feed them and in the same way it is right to give them spiritual nourishment and teach them about the love of God from an early age. When they are old enough they may choose to be confirmed and to make an adult affirmation of faith. However, you may wish to talk over any doubts and concerns you have with one of the priests. They will be happy to help. What happens in the Baptism service? The priest will make sure you know where to sit and when you need to move. Some parts of the service will be for the whole congregation to join in; some will be for you and the godparents. The sign of the cross The priest will make the sign of the cross on the candidate on two occasions. This is like an invisible badge to show that Christians are united with Christ and must not be ashamed to stand up for their faith in him. Water The priest will pour water over the candidate. Water is a sign of washing and cleansing. In baptism it is a sign of being washed free from sin and beginning a new life with God. Water is a sign of life, but also a symbol of death. When we are baptized our old life is buried in the waters (like drowning) and we are raised to new life with Christ. Anointing Before the Baptism the priest will first anoint the Candidate with the Oil of Catechumens. This is a practice dating back to the very early Church when adult Candidates were set apart for some months in order to prepare for this important turning point in their lives. After Baptism the priest anoints the newly Baptised with the Oil of Chrism in preparation for their Confirmation, of which Baptism is part. Confirmation normally takes place when the Candidate is old enough to answer for themselves. Q| Can we have a private service of Baptism? 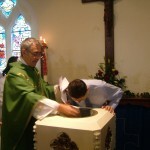 A| Baptisms usually take place during the Parish Mass, because they are a public declaration that your child has become part of the church family. Q| What is the right age for baptism? A| Baptism can happen at any age. What matters is that those concerned believe it is right to ask for Baptism. When teenagers and adults are baptized it is often in the context of Confirmation, celebrated by the Bishop. Q| I’m not a regular churchgoer. Can I still have my child baptized? A| Yes. We believe God’s love is available to all. Q| What does it cost? A| The Church of England does not charge for this Sacrament, although there is a small fee for the paperwork involved. However, in order to maintain our service and pay our bills, we would ask you to consider making a donation. We do have to charge a fee, for copywrite reasons, if you wish to Video the Baptism. Q| What is a godparent? A| Godparents are only required if the person to be Baptised is not old enough to answer for themselves. They must be Baptised and, preferably, Confirmed. You should have at least three: they promise to pray and support the child and to help the parents to bring up the child in the Christian faith. It is an important and responsible role. If the person is older it is usual to have Supporters. Godparents can be family members or friends. However, it is important that you choose people who will take an interest in your child’s spiritual welfare and who will pray for you and your child. Q| I was christened as a baby. Can I be baprised as an adult? Christening is another word for Baptism. Thus, if someone christened as a baby, they have been baptised. As this Sacrament is one of three that create an indelible mark called a ‘sacramental character’ on the recipient’s soul (the other two are Confirmation and Holy Orders) it cannot be repeated. Even though some churches only recognise ‘believers baptism’ the Church of England affirms that Baptism creates an invisible bond between God and the person. At whatever age, once you are baptised, you are part of the body of Christ. For those who wish to affirm their commitment as Christians we offer a wonderful service that allows just that. Thanksgiving for the Birth of a Child. Sometimes people want a Service of Thanksgiving before Baptism at a later date. Please talk to a priest about this.